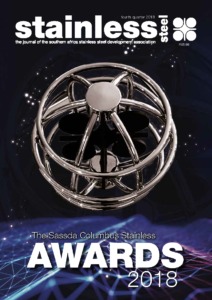 This quarterly magazine is the official journal of the Association and promotes the awareness and usage of stainless steel, featuring different facets of the industry and reports on current activities and product news both locally and overseas. It also keeps readers up to date on Sassda news and activities. teel has an international circulation of over 4,000 readers involved in the stainless steel industry including primary manufacturers, distributors, stockists, fabricators, converters, consultants, designers, architects and end users. This magazine is free to all members and residents of South Africa, but there is a subscription charge for overseas recipients.